Where one CAN simply walk into Mordor. 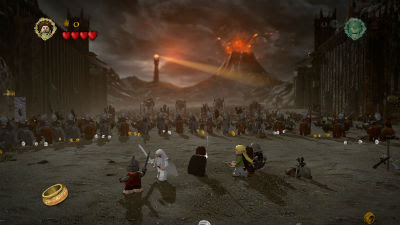 Following the events of the movie trilogy, this LEGO retelling is much more humorous despite using the same voiced lines. How much more humorous? Well, Strider managing to lock the Nazgul in the toilet in the Bree Tavern is a good example. Who do you get to play during this? Well, everyone. In story mode you can switch between active party members at will, and will need to as different people have different skills. Sam can make plants grow, Gimli can smash rocks, Legolas can jump higher etc. It's also not too challenging, though some bugs towards the end might require a few mission restarts. Speaking of bugs, I also needed to reduce the resolution to get it to run smoothly, but YMMV. This is definitely designed for collectors though, because after finishing all the story content I only had 33% completion. The rest is found in the open world "free play" which is both massive and for me, empty. Still, this was a fun and mostly relaxed way to relive the movies so I give it 3 rings out of 5.